Have you ever imagined how you would cope if you didn’t have a tap with clean water at home? How would you wash, and what would you drink? And what would you do if there was no toilets available? Ambohimahatsinjo is a rural village in the highlands of Madagascar. People there are a hard working tight-knit community, but they face many hardships because they don't have clean water or toilets in their village. 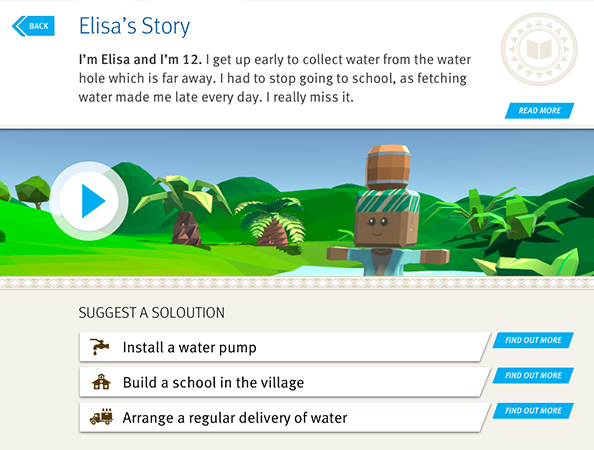 In this game you will explore the village and surrounding area, talk to three key villagers, and help WaterAid decide what solutions to implement. An engaging game where you get to explore, understand problems and choose solutions to help WaterAid in their quest to improve lives and help people step out of poverty. First you need to get the game to your device. Find it in the Apple Store for your iPad, or on Google Play for your Android tablet. For Mac and PC, the links above will download a .zip file. On Mac OS just double click to open the app. On windows, follow the instructions in the "Readme.txt" file. Ernest, your guide will introduce you to the village. Then you will need to find 3 key people: Elisa, Cynthia and Marco. Each of them has a problem that you'll need to investigate and help to solve. For each problem, you'll be able to propose different solutions. But be careful before you choose; make sure you find out exactly what each solution entails. Present your solutions to WaterAid, but bear in mind that funds may be limited! After a few months, you'll be able to see how the village has changed. Everyone you meet will have something relevant to say. You may want to keep their quotes to remind yourself of their issues, and to use them on your final report. You can also take pictures as you go along. There are breath taking landscapes in Madagascar, but you'll have to look out for hidden perils, such as the poo bushes! Once your aid work project is completed, you'll be able to put together a report with all you've learnt and done. You can use your quotes and pictures here, and you'll be able to share it and print it out. If you are a teacher and you want to explore issues regarding the global water and sanitation crisis with your class, WaterQuest is a fun and interactive way to learn. It is aimed at Key Stage 3 and 4 Secondary School students. It is specially well suited to the Geography curriculum, but it will work well within the context of Science, Citizenship and English, as pupils will be asked to explore and understand the plight of villagers in Madagascar, offer solutions and then compile a report using the quotes and images they have compiled during their exploration. Aimed at 14 to 16 GCSE students, WaterQuest is an engaging way to explore the global water and sanitation crisis. Navigate the village and surrounding area. Locate the school and water hole, find the people and listen to what they have to say. Document your findings with quotes and images, then compile a report to print or share.